If you're like most people, the mysteries of your home's roof and attic will remain just that - mysterious. That is, until you realise you've got a leak. As a rather wet, windy island - especially on the west - leaking roofs are fairly common in the UK. But what are your first steps upon discovering a leak? Because water ingress can cause serious damage fast, it's important to act immediately. Call a reputable roofer to tackle the leak. But what can you do while you're waiting for the roofer to arrive? A leak will usually cause water to pool in one area, before spreading out and finding entry points such as light fittings. Over time, more escape routes will be found by the water, which may make the leak look rather more serious than it really is. Examine the ceiling for a bulge and then place a bucket under it. Proceed to poke a small hole in the centre of the bulge and allow the water to escape into the bucket. Some leaks allow a more gradual ingress of water. 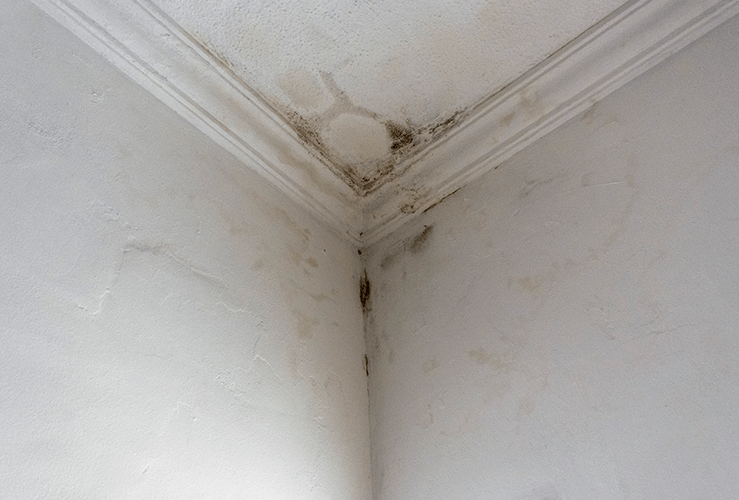 Often, patches of mould on a ceiling or on rafters are a sign you have a leak. Rotting timbers are another sign of water ingress. It's not always easy to identify the source of a leak. Remember that where water enters through a roof and where it enters through a ceiling may not be in alignment. If a layer of plywood lies under your roofing, it's common for water to enter through the roof and travel to the nearest joint. If it is still raining, locating the leak may be easier (although repairs may be harder). If it is no longer raining, try enlisting someone's help to pinpoint the leak. If you feel confident enough to do so, ascend the roof with a hose and begin pouring water over the roofing. With your helper in the attic or cavity under the roof, get them to yell when they see where the water is coming from. Having identified the leak, you can carry out a temporary repair with roofing tape, roofing cement or a tarpaulin. Apply roofing tape or cement to the inside of the roof, where the leak is issuing from. You can also carry out an effective short-term repair by laying tarpaulin over the damage on the roof exterior. As above, you should be confident in your ability to scale your roof before attempting this. Secure the tarp in place using long sections of wood (sometimes known by the U.S. name "2 x 4"). Taking these measures should help minimise damage until a roofer can visit to carry out a permanent repair.